Alejandra Goyenechea, International Counsel at Defenders of Wildlife and Chair of the Species Survival Network's (SSN) Amphibian Working Group, spoke with Laurel Neme on her "The WildLife" radio show and podcast about the global amphibian trade. This interview originally aired February 8, 2010. Assistance for this article was provided by Ben Kennedy. Alejandra Goyenechea, International Counsel at Defenders of Wildlife and Chair of the Species Survival Network’s (SSN) Amphibian Working Group, spoke with Laurel Neme on her “The WildLife” radio show and podcast about the global amphibian trade. 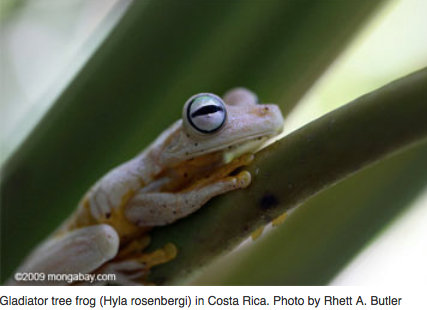 In her interview, Alejandra Goyenechea discusses the benefits of frogs and the many threats – such as habitat loss, climate change, pollution, invasive species, disease, and overexploitation – to their survival. 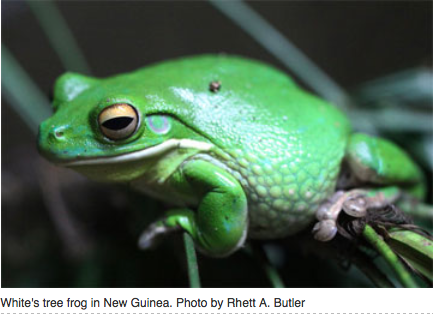 Did you know frogs indicate environmental quality, like canaries in a coal mine? Or that many have medicinal properties, like the phantasmal poison dart frog which produces a painkiller 200 times the potency of morphine? A booming international trade exists that uses frogs for food, pets, medicine and scientific purposes – a trade that is now jeopardizing the continued existence of many species. However, as Ms Goyenechea explains in her interview, the laws that exist to protect amphibians and prohibit their export are difficult to enforce. She also sheds light on the challenges of captive breeding of amphibians, the importance of scientific research and the overarching challenges of studying amphibians. Finally, she discusses steps taken by her organization, Defenders of Wildlife, to stem declines in amphibian populations. 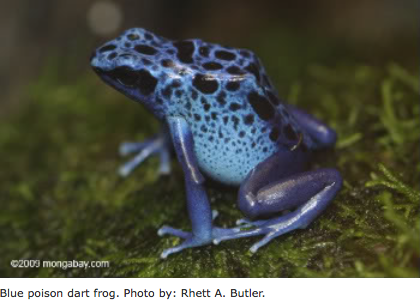 These include proposals to list certain amphibian species in the Convention on International Trade in Endangered Species (CITES) appendices, and to improve documentation and regulation of amphibian imports, particularly with respect to certifying the absence of chytrid fungus that is currently decimating frog populations. 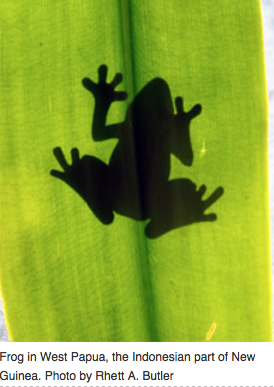 In November 2008, Defenders proposed that 13 amphibian species be added to CITES, and in September 2009 the organization filed a petition with both the Department of the Interior and the Department of Agriculture regarding regulations to prevent the infected frogs from entering and thus stop the invasive fungus at the border. Alejandra Goyenechea is International Counsel at the International Conservation Program of Defenders of Wildlife and also Chair of the Species Survival Network's (SSN) Amphibian Working Group. Her primary focus is the Convention on International Trade in Endangered Species (CITES) and other international trade law issues, with an emphasis on Latin America. She has worked at several international institutions and organizations and has experience in wildlife policy and broader experience in other environmental areas. During her work with the Mexican government she represented the Environmental Enforcement Agency at the international level. She also has interned or worked at the Organization of American States, the United Nations Environment Program (UNEP) North American office, and the DC law firm Baker Botts. 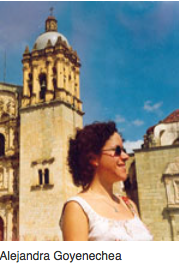 Ms. Goyenechea earned her law degree at the Instituto Tecnológico Autónomo de México, in Mexico, and came in 2000 to Washington DC to complete a Masters degree, LLM, in International Environmental Law, at the Washington College of Law at American University, with a Fulbright scholarship. She speaks fluent English, Spanish and French. 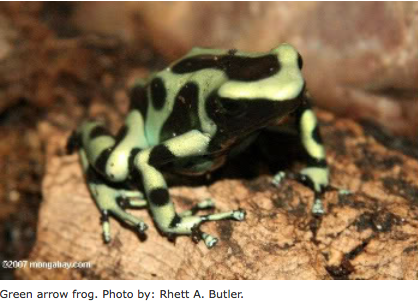 Laurel Neme: Why are amphibians so important? Alejandra Goyenechea: There are a lot of benefits of amphibians in this world. First of all, they are an indicator of environmental quality. They can tell us if something is wrong with the environment. They are also very beneficial to both human being ecosystems and health. For example, they have antibiotic and antitumor properties that we can take from their skin. They are also very, very important for a lot of humid countries in that they consume thousands of insects. This can help crops and it can reduce insect-borne diseases, like malaria. Laurel Neme: They're not only like canaries in a coal mine for environmental quality but they have properties for medicines, and help us control insect-borne diseases and help crops by reducing pests, right? Laurel Neme: (Laughing) And how big is this tiny, tiny, tiny frog? Alejandra Goyenechea: (Laughs) It's so tiny! It goes from 1 cm to 4 cm. It's the phantasmal poison frog [Epipedobates tricolor], which is a species of the Epipedobates genus. 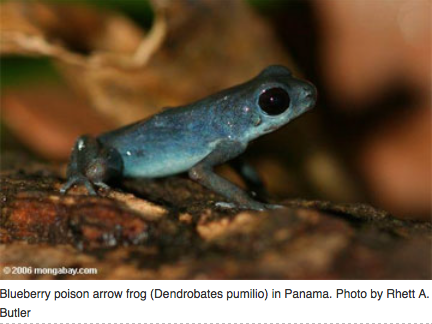 It's a tiny poison dart frog that lives in Ecuador. This frog is very interesting and has a very particular medicinal use. It's a painkiller that is 200 times as potent as morphine. It's used for muscle relaxants. [The frog] is so tiny, but we can use so much out of it. A lot of the frogs do have a special property. There are so many uses we can have from amphibians. Other than being beneficial towards health and the ecosystem, we can use them for food. We can use them for scientific research. We can use them as pets. We can use them as ornaments, as jewelry. Laurel Neme: When we talk about amphibians, are we mostly talking about frogs or newts and salamanders as well? Can you give me a picture of the range of amphibians and how many there are? Alejandra Goyenechea: Amphibians include frogs, toads, salamanders, and caecilians [an order (Gymnophiona) of amphibians resembling earthworms]. How many are there? According to the IUCN Red List, there are 6,285 species. Laurel Neme: Are most of them very common or do a lot of them have protection? Alejandra Goyenechea: A lot of them are really on the verge of extinction. I don't know how many are now critically endangered. Laurel Neme: Let me back up for a minute. 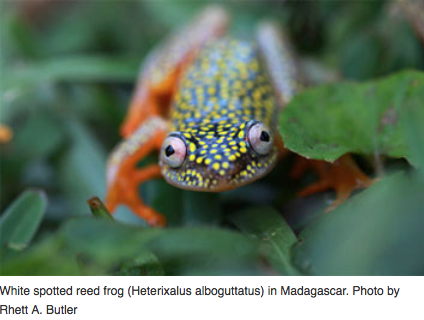 Of those more than 6,000 amphibians, where are they? Are they in particular countries or particular regions or can they be found all over? Alejandra Goyenechea: Where you're going to find the biggest concentration of amphibians is certainly in countries with rich biodiversity. And where is that? You're going to find them in tropical regions, such as Central America. Central America is a very rich area. Central America goes all the way down to Venezuela, Colombia. There you're going to find a big concentration of amphibians. Also, the other place you're going to find them is in Southeast Asia, in Indonesia, in the Philippines. You even find amphibians in the deserts, in the mountainous regions of Iran, for example, in China, all over. But the biggest concentrations are in the countries of rich biodiversity. Laurel Neme: Are many of those species in danger of extinction? What proportion is under threat? Alejandra Goyenechea: That's a very good question. And actually, it's interesting that now, they just declared last year that 1/3 of amphibians are in danger of extinction. Also last year, IUCN declared last year that ¼ of mammals are in danger of extinction. So, you can see that amphibians are in worse shape than mammals today. Laurel Neme: What are the threats to amphibians? Alejandra Goyenechea: Unfortunately, there are a lot of them, and they're caused by us, most of them. The first one we can say is habitat loss. You also have pollution: chemicals that we throw in our gardens, chemicals from the industry, pollution from cities, from crops. [There's also] climate change, [and] of course, invasive species. A lot of people don't think of this, but … would like to introduce trout or another type of fish in a pond. [They] decide, "Let's grow this fish in this pond so we can have some fishing and have some fun in here!" Well, sometimes, those new species that are introduced in lake, ponds, whatever, they are invasive. They eat the eggs of the amphibians, and they are not used to that. 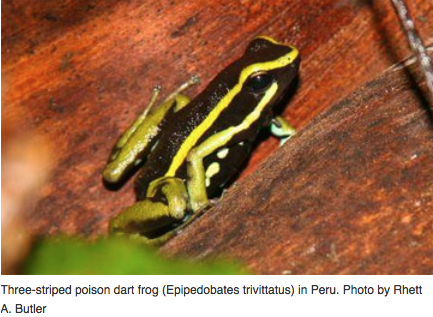 Another threat for amphibians is disease. That's another big topic that I can talk about, but in summary, one of the biggest diseases that amphibians face now is a fungus that is going through them and killing them. Laurel Neme: Tell me more about this fungus. Alejandra Goyenechea: It's amazing how fast this is reproducing. What this fungus does is it prevents the skin to breathe properly. As we know, amphibians breathe through their skin. [The fungus] is also transmitted through water. Frogs live in water, so this transmits so rapidly. It is exterminating populations of amphibians. 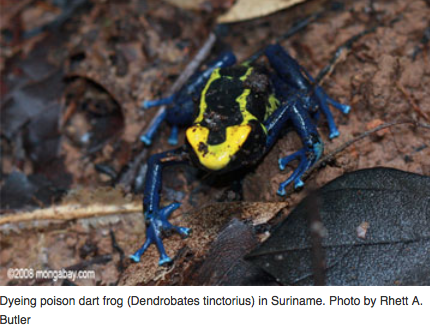 Laurel Neme: Are there other threats to amphibians? Alejandra Goyenechea: Overexploitation is a big, big threat that was just recognized last year by the IUCN. Laurel Neme: Do you know how many species are affected by trade? Alejandra Goyenechea: Out of more than 6,000 species, 141 are affected by trade. This means that the main threat has to be trade. [However,] a lot of species are threatened by [more than one threat like] climate change and trade. So this is sometimes hard to take into account. [That means] there can be much, much, much more than 141 [species] that are affected by trade. Laurel Neme: Okay, it's hard to determine if it's 51% or 48% affected by trade. For trade, what are some of the main uses for frogs? Why do people want to buy them? Alejandra Goyenechea: Why do we want to use them? We want to use them to eat. We want to use them as pets. We want to use them for medicinal purposes, and we want to also use them for scientific purposes. Laurel Neme: Can you tell me about the species for each use, and where they're from? Alejandra Goyenechea: For the food trade, you're going to find some of the species that are mostly from Southeast Asia, like the Fejervayra genus, the Limnonectes genus, and these will serve several areas of the world. Also, you have in Chile a very large species that is found and is the most traded also for the food industry. Laurel Neme: So different species are used for different things, which makes sense. Laurel Neme: What about for medicinal purposes? Alejandra Goyenechea: For medicinal purposes, there are 66 species that are used for medicinal purposes. And this is an interesting fact, but for the scientific purposes, our pregnancy tests, we have to thank the amphibians for that. Laurel Neme: Really?! What amphibian was used in the pregnancy test? Alejandra Goyenechea: It's a species called Xenopus laevis [African clawed frog or Platanna] from South Africa. Scientists used to inject some urine on it and try to use the frog to know if the person is pregnant or not. So that's how they started to develop the pregnancy tests. Laurel Neme: What are some of the other medicinal uses? You mentioned painkillers earlier. What are some of the others? Alejandra Goyenechea: There is one in Mexico that is actually extracted from a lake, and also it is used locally for medicinal purposes for heart problems. Laurel Neme: Is it usually local, traditional medicine that uses amphibians or has it become a big industry now? Alejandra Goyenechea: It started as sort of a local thing, but like everything, I guess [it expanded]. For example, I can compare it to plants. Plants started to be used as local medicine, but then as soon as it was discovered by industries; they exploited it for the entire world. Well, I mean, some of them. Some of them stayed in the area. Laurel Neme: Is it legal to use amphibians for these purposes? Alejandra Goyenechea: That will depend on the laws of the country. Most of the countries, especially the ones in Central America, the ones that I am a little bit more familiar with, they do have laws that prohibit the use or the export of wildlife. But, unfortunately, there is very little enforcement in a lot of these countries. They have great laws. They are there. It is really hard to enforce them. Laurel Neme: What are some of the challenges of enforcement? Alejandra Goyenechea: That's a very good question but, unfortunately, is it not that easy to say, "Well, that is prohibited," and that is the solution. Mostly, I think the most important thing for enforcement is [it's] a learner's program. Laurel Neme: What do you mean by that? Alejandra Goyenechea: What we need is education to everyone, to the children, to us, to know that if you see a little frog [when] you go on a forest trip, [or other] wildlife, it belongs there. You don't take it. I mean, it looks cute, but that's where it belongs. You have to recognize not to take it as a pet and not to consume it. Also, another problem is that we, as in governments, have a lack of sustainable harvesting methods. We also have a lack of action plans for threatened species. That means that some countries are more advanced than others. But, unfortunately, the ones that have a richer biodiversity do not have that much capacity to handle these kinds of plans. We have the problem of law enforcement. And this is not only, unfortunately, in countries of development. We have the problem here in the United States. Laurel Neme: Tell me more about enforcement in the United States. Alejandra Goyenechea: We have a lack of personnel. It's amazing that the United States has a lack of personnel. Today, there are just below 200 agents to enforce wildlife laws. In 2002, there were 238 agents, which is nothing. But now, we have below 200. This is a big problem. Why? Because when you have all these ports of entry, and when you have that many imports that arrive at the ports of entry, not every agent is capable of reviewing all the shipments. And they're not trained to [distinguish] which are the species that are endangered, and which are not. In amphibians, for example, one species [that is fine to trade] has black eyes and then a little line on the side, [while] another species, which is threatened [and protected], doesn't have the line. So, how do you know which is the shipment that can go through or not, [especially] when you have so many shipments waiting for you. Laurel Neme: How many are protected in CITES (the Convention on International Trade in Endangered Species)? Alejandra Goyenechea: There are 114 species that are listed in Appendix I and II. In Appendix I, you have 16 species, and in Appendix II, you have 98 species. Laurel Neme: Are there guides so that you can know which ones are which? Alejandra Goyenechea: An expert can determine that and our enforcement officers, who have been trained. But they also have to be trained not only in amphibians, they have to be trained in all species of wildlife. So, this is almost impossible. There are some guides that are done by some NGOs, but [identification] is very hard because some amphibians, they're like chameleons. When they're sleeping, they look a certain way. And when they're awake, they look another way. When it's a female, it can also [look] different. When they're juvenile, they look another way. So, even if someone had been trained and has pictures of how it looks one next to another one, it is very, very difficult to identify shipments and shipments and boxes and boxes of amphibians. Also, let me just tell you this: last year in 2008, Congress only allowed $59.6 million for law enforcement. [This] sounds like a lot, but it is not. That is almost nothing to enforce the laws. And this [amount] is for everything, not only for amphibians. Laurel Neme: What is the volume of trade in amphibians? Alejandra Goyenechea: The volumes are very interesting. The United States imported 4,000 tons of frog legs from 1998 to 2002. Laurel Neme: Now, that's only frog legs. What about for the pet trade? Alejandra Goyenechea: Another interesting [statistic] is that from 2003 to 2007, more than 11,000 live amphibians imported from Latin America to the United States were critically endangered, endangered, or vulnerable, and 99.6% [of these] came from the wild. The exact number is 11,262 live amphibians coming from Latin America, [virtually] all of them from the wild. Another [statistic] is that between 1999 and 2008, more than 267,000 specimens [meaning individual frogs] of a single genus [were imported into the United States]. This is the genus of Agalychnis. It is a nice frog that you have seen almost everywhere. It has red eyes and has a green body. More than 207,000 were imported into the U.S. in a frame of 10 years. 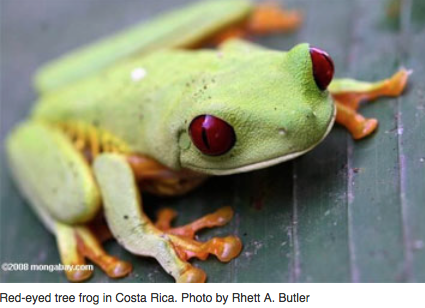 … [It's] the red eyed tree frog that you see everywhere. 99.8% were used for commercial purposes, to put them in pet stores. Laurel Neme: So, depending on where it came from, it could be perfectly legal to import those frogs or to have them as a pet? Alejandra Goyenechea: Yeah, if there is no regulation, which mostly there is not. The only regulation we have here would be the Lacey Act, but if it's not included in the Convention on International Trade in Endangered Species of Wild Fauna and Flora, which is most commonly known as CITES, there is no regulation whatsoever that says that they have to present a [permit or other document] saying it's legal. So, when they come from, let's say, Costa Rica or from another country, and they were acquired illegally over there, there's nothing the United States can say because there are no regulations saying that you need to present a paper saying it is legal, even if they're not included in CITES. There's no control. In the United States, there is a record if people declare it. If people do not declare it, there's no way you can know how many frogs are coming in. 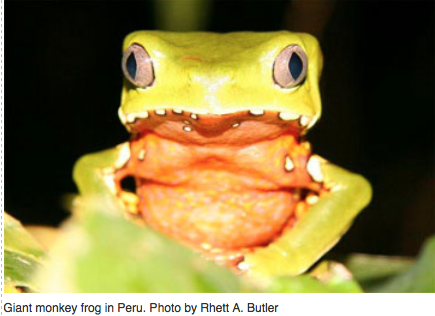 Laurel Neme: How much do we really know about the amphibian trade? You had mentioned that the data available is only for what has been declared. Alejandra Goyenechea: The data that was obtained was through the U.S. Fish and Wildlife Service. This is because [importers] are declaring [shipments] at the entry ports. 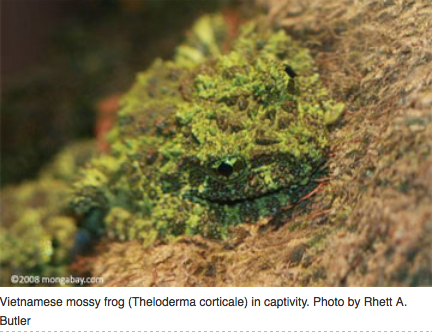 [Importers] are declaring X number of frog legs, or X number of amphibians to sell as pets. But if [the imports are not declared], then it's really hard because the exporting country is not required to [provide a document] saying that [exports] are allowed or that they were legally acquired. [The exporting country] does not have a record saying [what] went out. If they're not [listed] in CITES, everything is up to the importing country [to say] "we have received this amount of frogs." In Europe, it's worse than the United States. At least in the United States, there's a database. In Europe, there's no database. There's nothing that requires you to say, "Okay, you have to register the number of species you have." Ultimately, their registration is so general. It's just like, "A shipment of amphibians entered Spain," for example. Say 100 entered Spain. The problem is that when it comes to identification, there is no level as to what species has entered. Laurel Neme: So you have no idea. You might know that it's an amphibian, but not that it's a particular species. 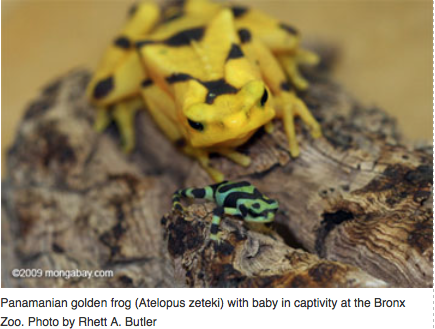 Laurel Neme: How much are amphibians worth? Is it a big business? Alejandra Goyenechea: It's amazing how much the market is worth. If a collector in Madagascar finds a frog and says, "Okay, I'm going to go and sell it," they sell it to an intermediary. Let's say they receive $0.10 per animal. The intermediary will receive four times that amount. After that, the intermediary goes and sells it to the exporter, and the exporter receives 26 times that amount. The collector receives only a tiny, tiny amount compared to what the animal is going to be sold for outside of the [local] market. 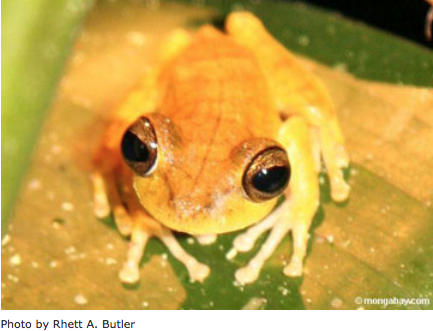 But, for example, if this is a frog that is included in CITES, like the Mantellas, the little ones that I was telling you are very cute, it's $5.00 a frog. So, the amount goes up considerably when the species are more desirable. [That's] because there are people who think that the more protected they are, the more desirable they are, [and] the more expensive they are because people believe that if they're protected, the more desirable they are. How much the collector receives also depends on how much somebody pays for it at the end of the market. Laurel Neme: What is the size of the market for amphibians more generally? Alejandra Goyenechea: The frog leg trade is estimated to be worth $40 million annually. The fish trade, in comparison, is $42 billion, and the beef trade is $26 billion dollars. So, it's pretty significant. Laurel Neme: What countries are the biggest importers? Alejandra Goyenechea: The biggest importer is France. You [also] have the United States, Belgium and Luxembourg. Luxembourg is so tiny, but it's one of the biggest importers! The biggest exporters are Indonesia, remember that I was telling you that Southeast Asia has a lot of amphibians, China, Belgium and Luxembourg. Why are Belgium and Luxembourg the greatest exporters? Because they re-export. … Then, you have Central America that distributes to Europe, to the United States, and to Asia. But it's mostly to the US and Europe for the pet trade because they have the nice, little frogs. Then you have South America that goes out and distributes mostly to China for food consumption. And you have Africa, mainly Madagascar, that distributes to the U.S. and to Europe, same thing, for the pet trade. 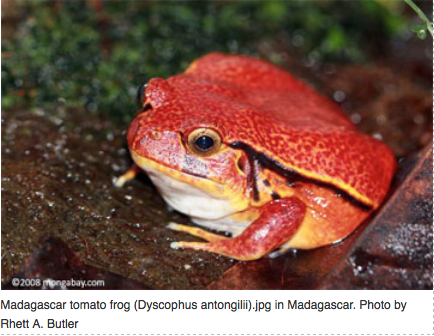 [There are] nice frogs in Madagascar. Who likes them the most? The U.S. and Europe. And you Southeast Asia distributes [frogs] to China and to Europe. Both are for meat consumption. Frog legs consumption in China, Europe, and the US. Laurel Neme: When you were talking about those statistics earlier, you mentioned most of the animals were wild-caught. Is there a captive-bred trade? Is there captive breeding going on? Alejandra Goyenechea: There is, fortunately. If not, we would be completely out of amphibians. There is [captive breeding] and it is used for several reason: for the frog legs trade, for the pet trade, and also for science. Laurel Neme: Tell me about scientific programs involving frogs. Alejandra Goyenechea: Scientific programs are used to save amphibians from the fungus I was talking about earlier. There are some programs right now in Panama, in Central America, and in Costa Rica where scientists are taking amphibians out of the wild and saving them – kind of like cleaning them from the fungus that is completely decimating populations. [Also, there] is a very interesting program that is going on with farming in Asia, I've seen pictures of those farms. It's just amazing. They have ponds where they just grow amphibians there. And those are the most successful ones because the pet ones are very hard to reproduce. 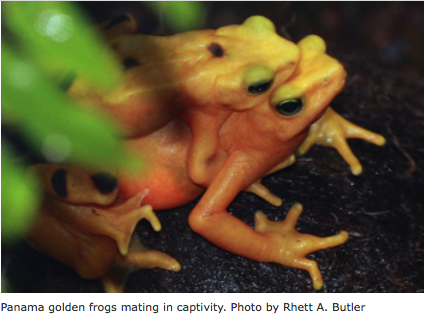 In farming, certain frogs are very, very, very hard [to breed in captivity], so, unfortunately, sometimes, farming does not alleviate the wild capture. Laurel Neme: Why is farming so difficult for some of the frog species that are used as pets? 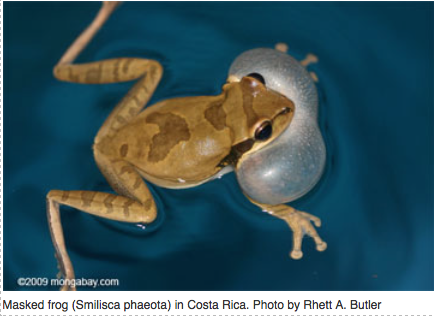 Alejandra Goyenechea: Because amphibians are used to very, very special conditions. Some of them are very strict about their food and their environment. Laurel Neme: When you take them out of the wild, like you take birds out of the wild, there are a lot of associated problems with destroying their habitat and then in their transport, up to 90% can die during the shipment. How is it with amphibians, to transport them and take them out of the wild? Alejandra Goyenechea: Yes, you're right. It's amazing how many birds, even though we're not talking about birds right now, die in transit. But in amphibians, the numbers aren't so high. I don't have an exact percentage as to how many die in trade, but it is really important to give them better conditions in transport. It's very hard. If you take an amphibian out of the tropical forest or out of the country, if you take an amphibian out of the desert, the conditions they have in transport are very harsh. They just cram them into a box when they're legal , or in season. At least they have a box when they're legal. When they're illegal, the conditions are incredibly bad. People just jam them wherever they can because they're illegal. Traders try to hide them. Laurel Neme: Sometimes you hear about people wearing reptiles on their person or in their socks or eggs in a specially-made vest with pockets as they travel. How are amphibians transported when they are illegal? What are some of the methods traders use? Alejandra Goyenechea: I think the most exotic [transport] stories that I've heard of [are for] other kinds of wildlife. I haven't heard yet of an exotic story of amphibians. But people have such a great amount of creativity and big imaginations to find ways to illegally transport wildlife that they do find amazing places to transport them illegally. [For frogs] it would be hard to put them in your pocket because they jump! So, it's not too easy to hide them. For parrots, what [smugglers] do is that they drug them so that they don't move. It's the same thing with amphibians. [Smugglers] drug them so they don't jump or make noises. But amphibians need moisture, some of them just live in water. So, it's hard to transport them illegally and not have a big percentage of them die on the way. Laurel Neme: I'm wondering about some big population decline. At a presentation you gave to the DC Bar Association, you said Mexico has 364 species of amphibians, of which only 183 are protected. And then you gave some interesting statistics about what prompted a ban on trade in 1988. Laurel Neme: (Laughs) So, not a good pet? Alejandra Goyenechea: I'm sorry! I mean, maybe some people love that type of frog, but I hold a different opinion. (Laughs) Yeah, it's not my favorite, but it could be beautiful to others. This is a big amphibian. So, it is used for food consumption. Laurel Neme: What does it look like? Alejandra Goyenechea: It's brownish, grayish. It's kind of long and big. It's kind of flat, and its head is more round than most other amphibians. It's very prehistorical, and that's probably why people think that it's beautiful. It definitely has a prehistorical look to it as a species. It's not appealing, though. It's nothing that you would want in your house. But, anyways, it was overfished in Mexico for the world demand. And unfortunately, it wasn't just overfished for the world demand, but it was also overfished for medicinal purposes. Laurel Neme: Why was it desired for medicine? Alejandra Goyenechea: It was used to cure respiratory problems. Laurel Neme: So, that prompted a ban on the trade or just this particular species? Alejandra Goyenechea: It was a ban on this species because, as you mentioned, only 183 are protected. So, 183 are on a list, similar to the endangered species list that we have here in the United States. That means they cannot be exported and that they have their own type of protection. But, just to let you know how many were exported in just one year, between 1987 and 1988, before the ban, 187,000 Ambystoma were collected to trade in a single year, and that's why they had to put the ban in place. Laurel Neme: Do they have figures on how many exist in the country. You know, what percent of the whole population that was? Alejandra Goyenechea: No, I don't have that. … For all amphibians, there is very little data available. Alejandra Goyenechea: Because amphibians are very hard to study. Just the population is very hard to determine, and there are not a lot of experts that carry out the studies. It's just very, very hard. … Amphibians aren't like other species. If you talk to amphibian experts, they're never going to give you specific numbers because it is too hard to decipher how many amphibians there are in a given place. Laurel Neme: What is Defenders of Wildlife doing in this arena to help protect amphibians? Alejandra Goyenechea: Right now, we have two different [areas] that we're working on. First, we're working with the Convention on International Trade in Endangered Species of Wild Fauna and Flora, CITES, supporting the proposals that were presented [to the March 2010 Conference of Parties] to list three amphibians. Laurel Neme: What are they? Alejandra Goyenechea: One of them is to list the Agalychnis genus. The Agalychnis genus includes the red-eyed frog and other nice frogs that live all the way from Mexico to Ecuador. So, Mexico and Honduras penned a proposal to add to CITES, and that [was] voted on [in] March . Another proposal [was] presented by Iran, which is called Neurergus kaiseri, a salamander that has really been exacerbated by Europeans in Iran. It is critically, critically endangered in Iran. So, Iran [made] a proposal to include it in the appendices of CITES. Laurel Neme: What is this salamander used for? Alejandra Goyenechea: [It's used] as a pet. It's beautiful. The salamander has black dots and orange lines. Collectors love them. I guess kids love them too. So, it is critically endangered. Also, we're preparing fact sheets. We're helping the countries lobby support the inclusion of species in CITES to give them more protection. We're also preparing on site events to stop the rate of extinction and the threat of international trade. We're also encouraging other countries to prepare analyses on which species should be taken into CITES. So, that's what we're doing regarding CITES. Also, regarding some international standards, Defenders just presented a petition to the US Department of Agriculture and to the US Department of the Interior requesting them to adopt some standards. Laurel Neme: What kind of standards? Alejandra Goyenechea: As we've seen, there aren't that many regulations. One of the regulations that we're trying to make happen is that, if you have some amphibians that have the fungus, chytrid, that I was telling you about that is really decimating populations, for it to be required to be declared. There [should be] a mechanism to [require] that frogs having the fungus [be declared] so that there are more possibilities to stop those [diseased] amphibians [from] entering [the country and] to have better control of frogs that have the disease. Now, there's no way for you to tell whether someone is bringing in frog that have the fungus. Laurel Neme: How can they determine whether it has a fungus? Is it something obvious? Do you have to inspect or do you have to do some chemical testing? Alejandra Goyenechea: Unfortunately, It's not obvious if they have the disease. You have to do chemical testing. It's kind of like a swipe test with a Q-tip. If I'm right, each test is $20.00, which is very, very expensive when you have to do it for each amphibian. So, what this standard will do is you will have to a declaration and declare which frog carries the fungus and which one does not carry the fungus. Laurel Neme: So, the responsibility goes to the importer to say that the amphibian does not have the fungus. Alejandra Goyenechea: It's kind of like when you're transporting your frogs you have to accompany them with some documents, and the document would either say that it was fungus free or it had the fungus. 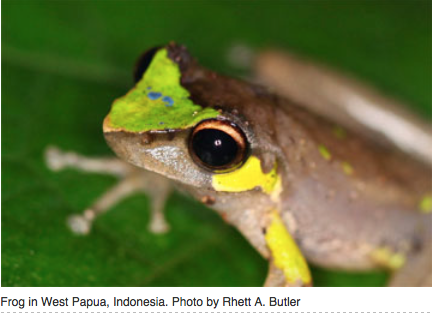 Laurel Neme: If people interested in helping amphibians around the world, what can they do? Alejandra Goyenechea: Amphibians really are endangered. They're really near extinction. The first thing you can do is go to www.defenders.org, support our work. And, I mean, it's very basic, just please, please, please do not throw chemicals in your backyard, in your little stream, in the river. Do not contaminate crops because, it's actually amazing, there are actually frogs that control all the mosquitoes that are around the crops. So, if you see a frog in your backyard or in your crops, I mean, that's a good sign, be happy, and take care of it! Do not consume frog legs. They're in big demand. They taste like chicken. So, my suggestion is: Eat chicken. And they're so tiny and so expensive. Do not buy frogs as pets. Frogs belong to the wild, and that's where they're happy. If you want to go and see an amphibian somewhere, you can go back. I mean, if you went to Europe or Africa, I know it's hard to go back, but take a lot of pictures and make a big poster so you can remember it. It's really hard to take care of a pet. Amphibians really need special conditions to live in and to stay alive as pets. They're very particular and really sensitive to their environment. And, just so you know, clients do establish their demands for pet stores. You can help by not buying the frogs that are in the pet stores. And the most important thing that I would recommend is that you respect the biodiversity of other countries. We really own it, and we really have to take care of the countries that are so rich in biodiversity. That is my advice for people, like you and I, who want to protect amphibians. For governments, [we need] political will. Even if governments know how endangered the amphibians are, if there is no political will, nothing is going to change. Cooperation among agencies, among INTERPOL, the Department of Agriculture, the Department of the Interior, the wildlife agencies, with us, the U.S. Fish and Wildlife Service, all of them, they really need cooperation. Also, more agents please! We need more enforcement and trained agents. And that's hard. It's hard to identify amphibians, as I was saying. It was hard to figure out how many agents we need, but we really need them. They're located at so many little ports of entry. People and amphibians come into many different kinds of ports of entry. Live wildlife costs more than dead wildlife. So, it's so much more if you leave wildlife where it is, and let it live. And in the end, it will make a difference.